Inspired by Japanese paper screens and Zen poetry, DREAMERS creates an atmospheric space to explore. 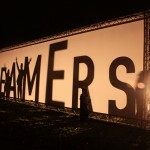 Large letters of mirror and steel are scattered across the grass and visitors are encouraged to weave in and out of them to cast their own shadows on the screen. 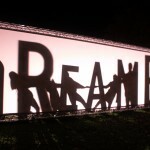 Sometimes pensive but often playful, the piece is activated by the imagination of those who visit it. 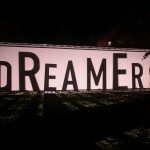 DREAMERS was commissioned as part of Lumiere Durham 2015, a four-day international light festival produced by Artichoke. The piece was supported by Dyer Engineering. 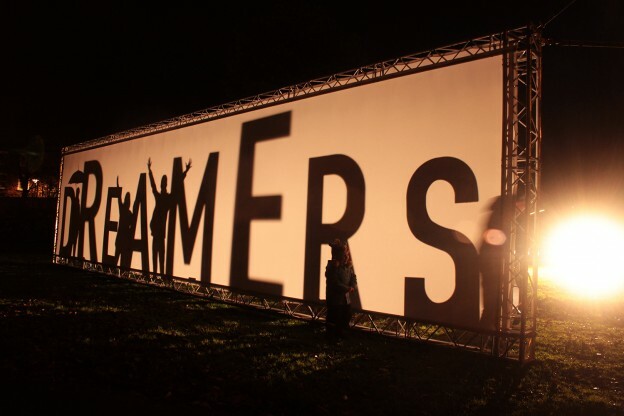 DREAMERS has been shortlisted for the Darc Awards Best Light Art 2016.